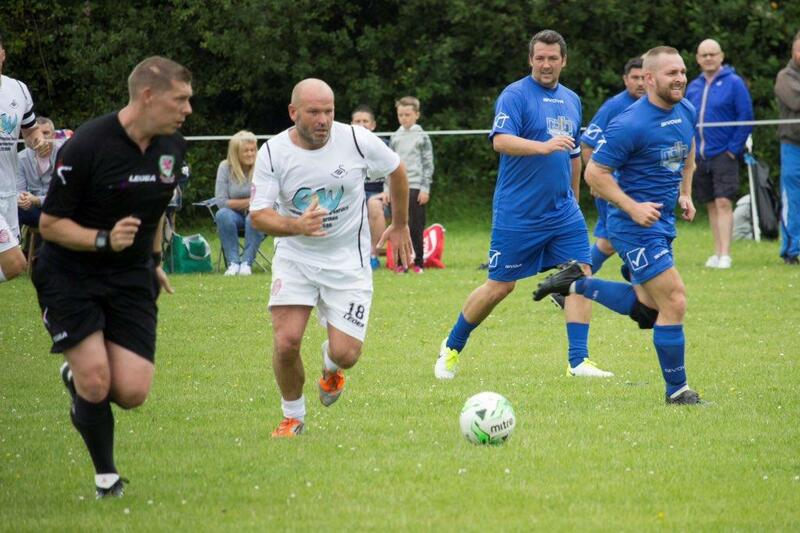 For the second year in succession, Carmarthen is set to host a charity football match between a Carmarthenshire Locals Select XI and Swansea City Legends – a team comprising of former Swansea City players. The inaugural charity game last year at Johnstown Football Club rose over £3,000 for the Swans4cancer Foundation, which was setup by Swans fan Mark Beevers in 2013, after his Dad Philip Beevers died of brain cancer. Last season’s game saw the Swansea City Legends side running out 13-2 winners against the Carmarthenshire Select XI, with Andy Robinson (6), Kerry Morgan (2), John Williams (2) and Kris O’Leary getting the Swans goals. James Northcote, whose father was tragically diagnosed with cancer, also bagged a brace for John Cornforth’s team. The Carmarthenshire Select XI, featuring former Leeds United, Leicester City and Wales International, Matthew Jones, was unfortunate not to open the scoring for the local side last year with a thunderous shot crashing down off the bar – which had looked to have crossed the line – only for referee Tom Bateman to rule it out. Such was the success of last season’s charity game and day as a whole; co-organisers Gareth Winston, Andrew Thomas, Llinos Thomas and John Cornforth were keen to see a repeat of the fixture this year. And with the blessing of Mark Beevers from the Swans4Cancer Foundation, an agreement was reached for the game to be played once again. This season the game will be played at Carmarthen Town’s Richmond Park ground on Saturday 26th May 2018 at 2:30pm. The Carmarthenshire squad of players will once again be selected from local teams from right across the west Wales area and who have played and helped their local football teams. Alex Davies, Michael Howard, Mark Clode, Kevin Austin, Matthew Bound, Kris O’Leary, Andrew Mumford, Andy Robinson, Jonathan Coates, John Williams, Lee Trundle, James Thomas, Jon ford, Steve Jones, Chris Todd and Kerry Morgan. John is also hoping to bolster his squad further with the addition of Leon Britton, Paul Connor, Adrian Forbes, Alan Tate and Lee Thorpe, but their selection will depend on availability and other commitments. Tickets for the game are just £3. After the game, there will be a ticket-only social event in the Richmond Park clubhouse with the players, featuring a Q and A session, raffle and auction. Tickets for the social event are £10. All proceeds for the event will go towards the Swans4Cancer Foundation. 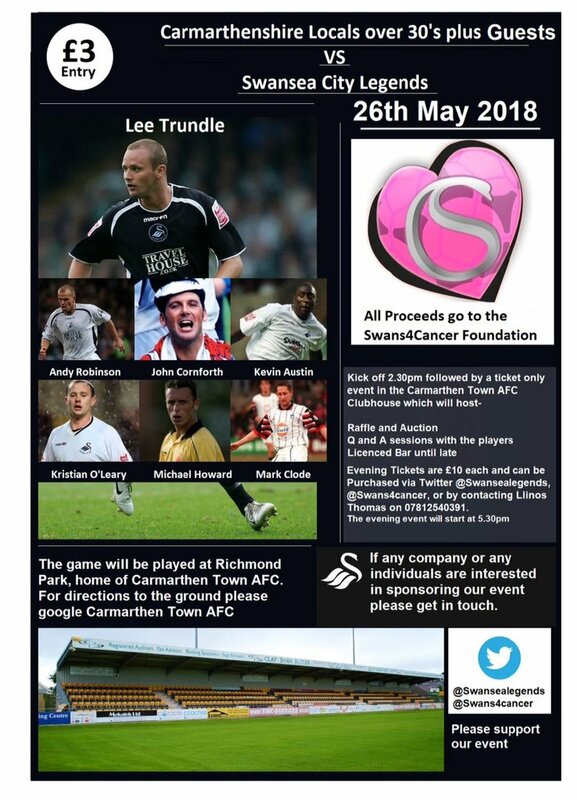 Tickets can be purchased by contacting Llinos Thomas on 07812 – 540391 or by contacting @swansealegends or @swans4cancer via Twitter. You can keep up to date with the latest announcements about the game and additions to the squads by following the @swansealegends twitter account.